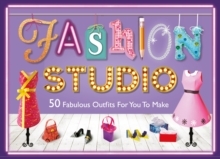 Everything you need to create your own 3D paper fashion collectionCreate 50 fabulous outfits using the press-out patterns and designer paper and tissue, complete with accessories. Then display them in the chic fold-out studio! Use the templates and techniques you've learned to create new collections, in your own original style, season after season. This gorgeous set includes a designer's handbook with detailed step-by-step instructions, exquisite double-sided papers and coloured tissues, press out patterns, a fabulous fold-out studio and notes on the couture origins of each look. The perfect gift for fashion lovers and budding designers.